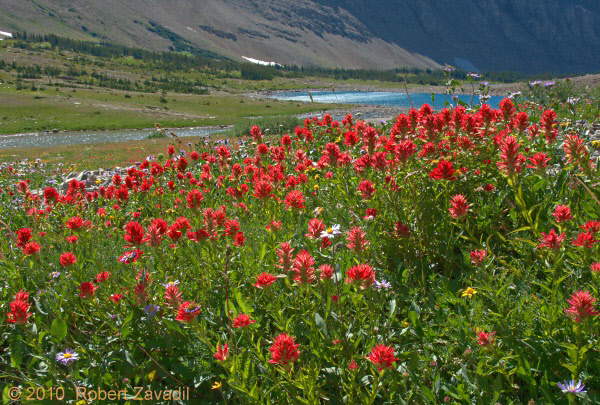 Indian Paintbrush can be found in many meadows throughout Glacier National Park. Native American legend describes a young brave who tried to paint the sunset with his warpaints. Frustrated that he could not match the brilliance of nature, he asked for guidance from the Great Spirit. The Great Spirit gave him paintbrushes laden with all of the different Indian Paintbrush flower colors, ranging from orange to scarlet to purple to even white or yellow. With these, he painted his masterpiece and left the spent brushes in fields across the landscape. These brushes sprouted into the Indian Paintbrush flower. Indian Paintbrush is found throughout the west of the Americas. Red, pink, orange, yellow, white/cream are the primary colors of Indian Paintbrush in Glacier National Park.